For a few years, I was in the active stable of Keynote Speakers bureau, and every few months would load BEHEMOTH into a trailer and trundle off across the US for a gig… usually filling in the gaps with more casual events and visits with friends or sponsors. This was a particularly fun one for me, as the subject matter is dear to my heart: designing for usability. 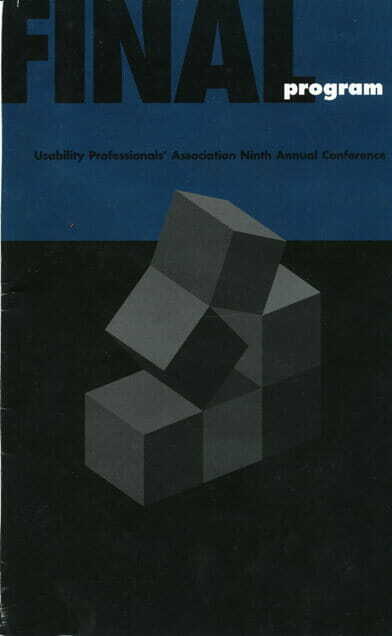 The conference took place in Asheville, North Carolina, in August of 2000. I was in what I thought was the home stretch of the Microship project (a year from launch), and used specific design issues to address the larger context of this important subject. “Art without engineering is dreaming. A Brief Rhapsody on Art and Engineering…. When designing a complex system, you must spend some relaxed time fantasizing about what it will be like when it’s done. After all, this is what drives the process of engineering: at some level between rigorous and fanciful, you need to hold an image of the finished product in your mind, savor it, and examine it from all sides. Only after this playful interlude (which, to a manager, may be disturbingly indistinguishable from unproductive wall-staring) can you decompose the design into subsystems, tasks, and packaging. Trying to shortcut this process by starting on Day One with formal design methodologies can have the catastrophic effect of committing one to an ill-defined goal state, whereupon the end result is shaped more by design tools than the supposed objective. That’s why so many products seem malformed, patched, and otherwise inelegant; the industry loves formal tools and generally looks askance upon such frivolous notions as approaching product design as a delicate blend of art and engineering. The exceptions, when they occur, are a joy to use. The rest simply miss the point, no matter how stylish their exterior or how sophisticated the underlying technology. During this talk, Roberts will present BEHEMOTH on stage along with Microship work-in-progress. The machines will be discussed in broad detail, with close attention to the usability issues that drove the design process. Integration of a multi-layered computer system into a tiny mobile platform created many interesting challenges, not the least of which was maintaining an effective physical interface while dealing with a potentially fatal real-time physical environment. This calls for massive design effort in blending the substrates themselves with wireless network architecture, automated data collection and telemetry, solar power optimization, user-interface design, audio/video routing, browser-based front-end and communication tools, harsh-environment packaging, well-behaved embedded control systems, and more. 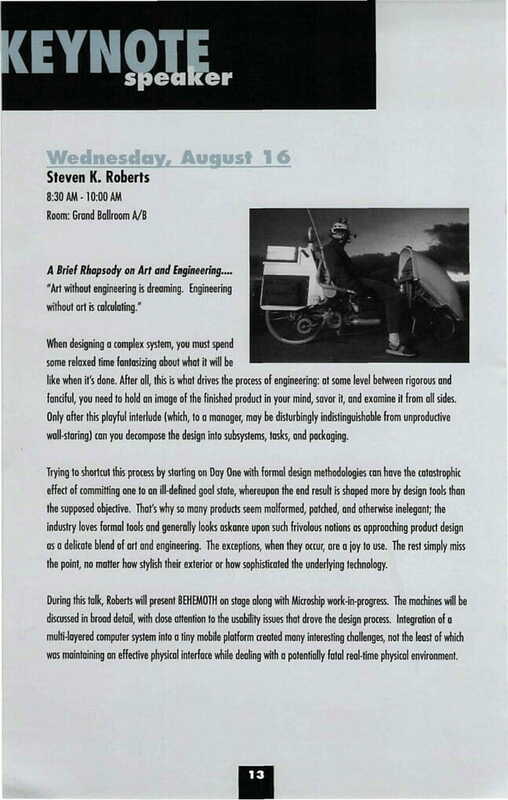 While on stage, Roberts will describe the growing phenomenon of technomadics, the blending of art and engineering, Internet collaboration, the critical importance of generalists in the design environment, and human factors issues in a complex multipurpose system… all tied together by spirited tales of a passionate high-tech adventure that began as a bike ride and somehow became a career. 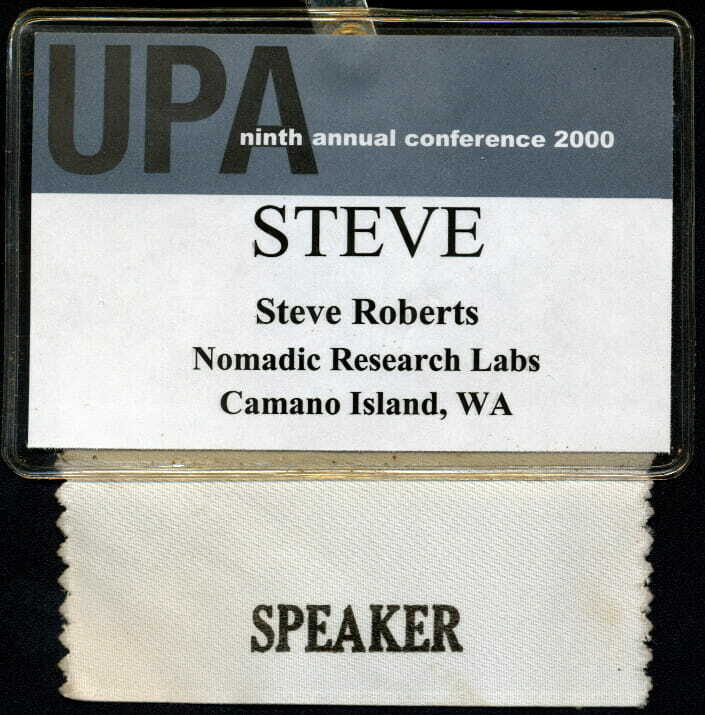 From 1983 to 1991, high-tech nomad Steven K. Roberts pedaled 17,000 miles around the United States on a computerized and networked recumbent bicycle that allowed him to remain connected and productive while wandering freely. 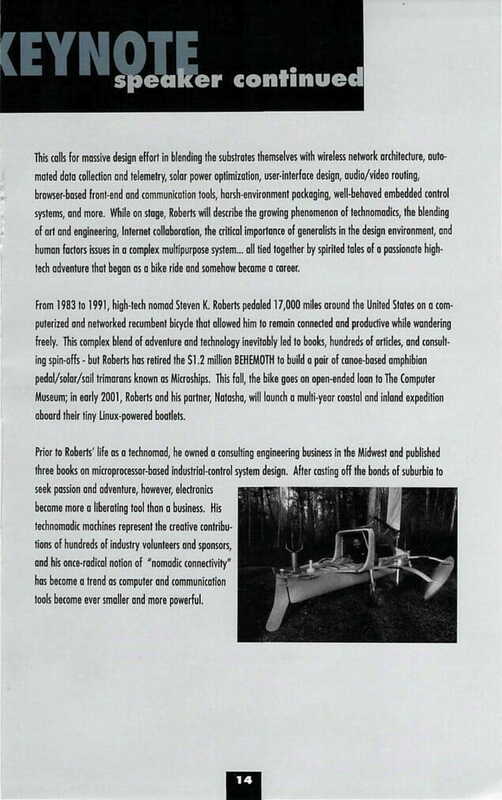 This complex blend of adventure and technology inevitably led to books, hundreds of articles, and consulting spin-offs – but Roberts has retired the $1.2 million BEHEMOTH to build a pair of canoe-based amphibian pedal/solar/sail trimarans known as Microships. This fall, the bike goes on open-ended loan to The Computer History Museum; in early 2001, Roberts and his partner, Natasha, will launch a multi-year coastal and inland expedition aboard their tiny Linux-powered boatlets. 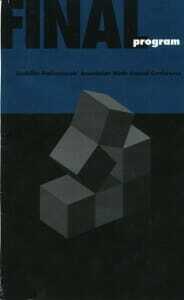 Prior to Roberts’ life as a technomad, he owned a consulting engineering business in the Midwest and published three books on microprocessor-based industrial-control system design. After casting off the bonds of suburbia to seek passion and adventure, however, electronics became more a liberating tool than a business. His technomadic machines represent the creative contributions of hundreds of industry volunteers and sponsors, and his once-radical notion of “nomadic connectivity” has become a trend as computer and communication tools become ever smaller and more powerful.